Alright, who has seen the Food Network show, "The BEST Thing I Ever Made"? There's also "The BEST Thing I Ever Ate" - which was the original, and, a better version, I think. Well, for those of you who know the show and enjoy it... you're about to get The Community Plate's version right now! I never would have imagined one of my favorite dishes I've ever made would be anything but Italian. Especially anything I thought up on the fly in the middle of the meat section at Giant. To be fair, I am only 26. I'm sure "the best thing I'll ever make" hasn't even be thought up yet. But this recipe was really great, with all the delicious flavors of a traditional Stuffed Chicken Cordon Bleu, but deconstructed for an all-around simpler concept. 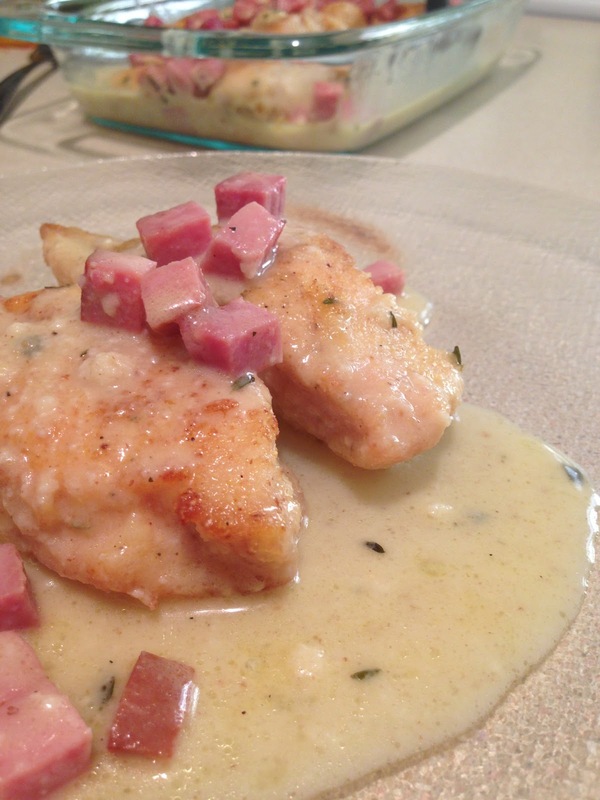 I originally just thought I would make a Swiss cheese sauce and add ham, and voila - throw it over some chicken and complete the dish. But then, I thought about it more: if I were to have a ham and cheese sandwich, the first thing I would bring out of the fridge would be a spicy brown mustard. And then I thought, when making chicken, I really like a hint of thyme. And then - crap! - I don't have any flour, looks like I'm substituting this corn muffin mix for flour! So, there's more to this dish than just ham and cheese. The corn muffin mix did wonders for the dish. It added a really sweet element that complimented the salty ham and acidic mustard and really made the chicken special. There are subtle flavors that bring everything together. There is the pop of vinegar with the mustard, there is an aroma of fresh herb, and most importantly, there is beer! 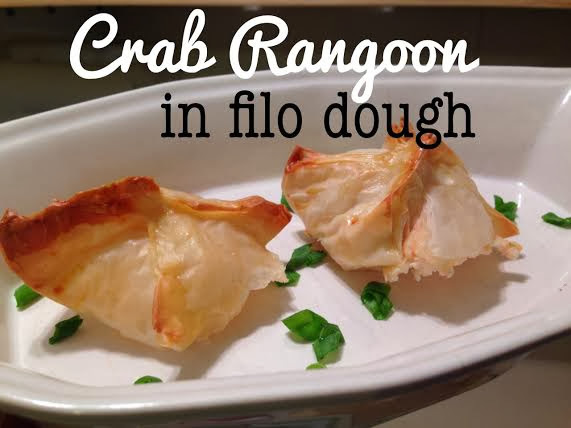 You have to make this dish as soon as you can! 1. Start by mixing the corn muffin mix and the breadcrumb together in a large bowl. Add half the fresh thyme, and mix thoroughly with a fork or whisk. 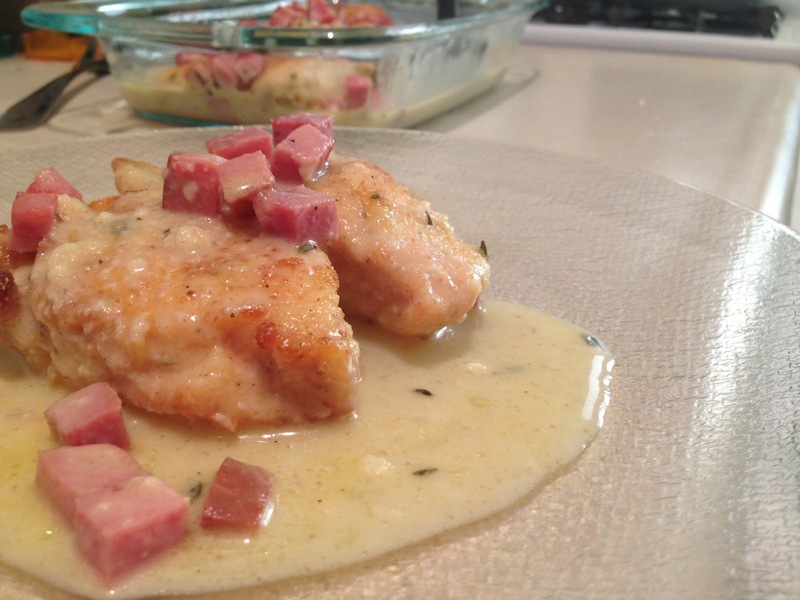 Slice your chicken breast to any thickness or size you would like. My breasts (hahaha) were about 3/4 of a pound each, and I sliced them in 3-4 pieces. I wanted multiple, smaller chunks of chicken rather than three or four large breasts. Season the chicken with salt and pepper, and dredge pieces in the cornmeal mixture, ensuring all of the chicken is generously coated. 2. Preheat your oven to 375-degrees. Heat your olive oil over medium heat. When the oil is hot, cook your chicken in the pan, ensuring a nice brown coating on the outside. Your only pan-frying the chicken for a few minutes on each side, just to get that brown sear on the outside. You'll then want to transfer your chicken to a pyrex dish and finish cooking in the oven, about 25 minutes. 4. In a small saucepan, whisk together the butter and the flour until thickened and the flour has dissolved. Slowly whisk in milk until incorporated. Whisk in Swiss cheese, and keep whisking until completely melted. (You can't do this over high heat. The cheese has to melt slowly so it doesn't become clumpy.) Stir in remaining tablespoon of thyme and some salt and pepper to taste. 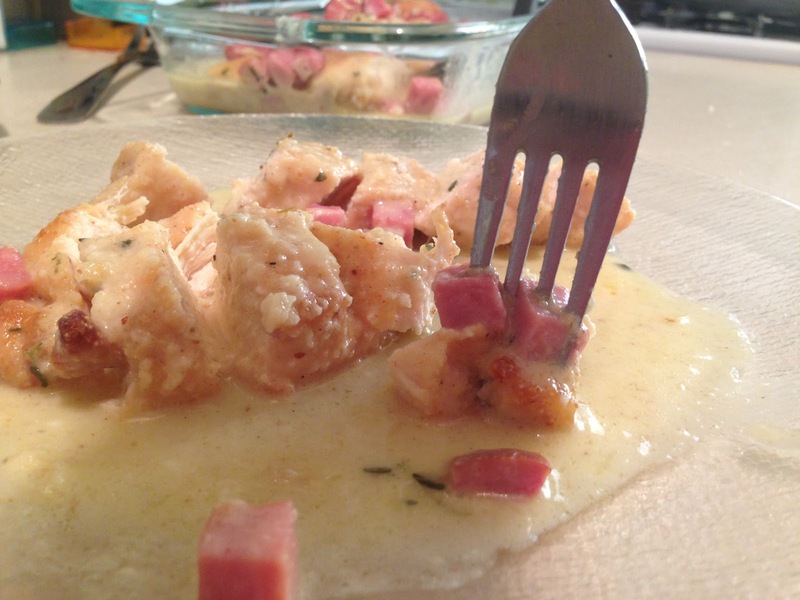 Pour your cheese sauce over the ham and mix well. 5. Lastly, remove the chicken from the oven. 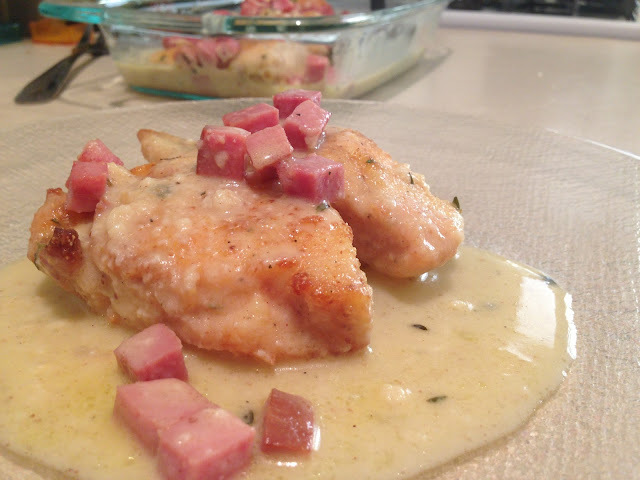 You can either pour the entire cheese-ham mixture over the chicken in the pyrex dish, or you can serve up the chicken on a plate and spoon the mixture over top. You can also pour the sauce on top, sprinkle with some additional shredded cheese and put back in the oven until bubbly. At this point, it's up to you! Please, please, please - tell me how you like it! Feel free to leave comments about any changes or substitutions you made, if it turned out great, or if it turned out completely crappy. I want to know!